Fun Subtraction Activities To Help Kids Have Fun While Learning How To Subtract. When they have fun, kids will enjoy learning. On this site you'll find some really cool subtraction activities as well as lots and lots of other fun math activities that your kids will love! Here's a fun, versatile game that can be played with double six, double nine or double twelve dominoes. We've included everything you need to play any version. Skill: Subtraction with differences of 0 to 6, 0 to 9, or 0 to 12. Object of the Game: Be the first player to run out of dominoes. Supplies: Set of six dominoes, number cards from the next page. Preparation: Print, laminate and cut apart the number cards. Shuffle and place face down on the table. Place all dominoes face down on the table. 1. Each players draws dominoes. For 2 - player game, each player draws 10. For 3 - player game, each player draws 8. For 4 - player, each player draws 7. 2. The first player draws a number card from the pile. Then she looks at her tiles and tries to find one in which the difference between the two numbers is the same as her number card. This domino has a difference of 5, because 6 - 1 = 5. 3. If player has a tile that matches her number card, she puts that tile in the discard pile. She places the number card in a new pile off to the side. 4. The other players follow in the same manner. 5. If a player draws a WILD CARD, she may discard any domino. If she draws a SWAP CARD, she can draw one domino from the discard pile and put any one of her tiles in. 6. 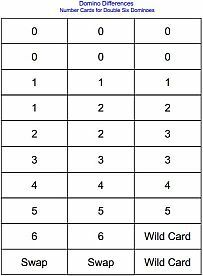 If the number cards run out before someone wins the round, the used number cards may be shuffled, stacked and reused. 7. The round ends when one player runs out of dominoes. That player is the winner of the round. Variations: Play with a set of double - 9, or double - 12 dominoes. Use the additional cards as instructed on the following pages. We will be adding subtraction activities from time to time, so be sure to check back with us often. If you have a favorite subtraction game that you'd like to share, please let us know.